Police work is a stressful occupation. Depressive symptoms, which may occur as a result of exposure to stressors in police work, have been known to be associated with an increased risk of cardiovascular disease. This cross-sectional study investigated the association between depressive symptoms and carotid artery intima-media thickness (CIMT) among police officers. CIMT was measured with B-mode carotid ultrasonography. Depressive symptoms were measured using the Center for Epidemiological Studies Depression (CES-D) scale. Analyses of variance and covariance were utilized to examine the mean values of common CIMT (CCA IMT) and maximum CIMT (MMXIMT) across quintiles of depressive symptoms. Participants included 412 officers (mean age = 41 years). Hypertension status significantly modified the association between CES-D score and CIMT. The association between CES-D score and CCA IMT was statistically significant (adjusted P = 0.030) but only among officers without hypertension. The associations between CES-D score and MMXIMT were not significant among officers with or without hypertension. Our results also showed that among officers who reported poor sleep quality, mean levels of CCA IMT, and MMXIMT tended to increase as depressive symptoms increased. Depressive symptoms may be therefore be independently associated with CIMT, yet masked by hypertension. Even though sleep quality did not significantly modify the main association, our results also suggest that poor sleep quality may act synergistically with depressive symptoms to increase CIMT. Future prospective work would help to clarify these associations. This work was supported by the National Institute for Occupational Safety and Health (NIOSH), contract no. 200-2003-01580. 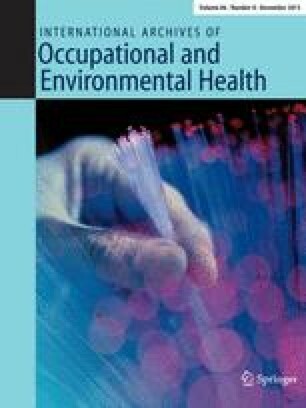 The findings and conclusions in this article are those of the authors and do not necessarily represent the views of the National Institute for Occupational Safety and Health.